This hardcover book with internal wire-o binding is 6.5in x 8in, a perfect size for readers to keep handy and reference often. The stylish design of this book, along with the interior photographs, illustrations and diagrams, make the learning process simple and fun for beginners and provides useful tips for more advanced readers.This book is an invaluable introduction to printmaking methods, taking you step by step through the technical details as well as providing inspirational examples of prints in all media. 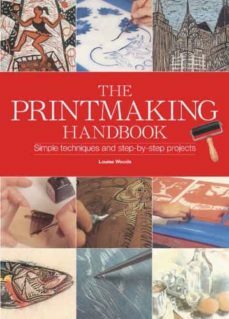 Although some of the print processes have a long tradition and are carried out in much the same way as they always were, there can be no doubt that modern technology has made it easier to extend the potential of individual printmaking methods and to combine their efforts in multimedia images.From relif printing to intaglio printing, and from lithography to screenprinting, The Printmaking Handbook has a wide range of information for anyone interested in printmaking.